Buying a car is never easy. Besides spending a sizeable amount ofmoney on this investment, your liveliness probably relies on thisvehicle. You need to know that your car will get you from point Ato point B in a timely and safe manner--so buying a lemon isnot something you can afford to do. 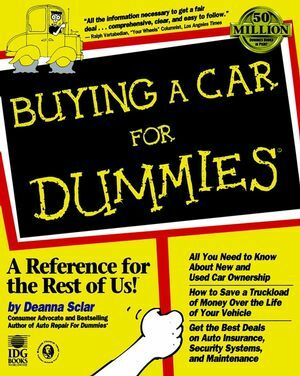 Buying A Car For Dummies is for you if you need to findout how to buy, sell, insure, drive, protect, or rent a vehicle. Itdoesn't matter how old you are (as long as you can legallydrive and have a license), this book can make your experience withcars a smooth ride. With Buying A Car For Dummies as your guide, you can parkyou fears, frustrations, and anxieties as you discover how todecide between buying or leasing new wheels, how to negotiate withcar dealers, how to foil car thieves and carjackers, how to protectyourself in a breakdown or accident, and how to protect yourautomotive assets with insurance, warranties, and servicecontracts. Plus, the book features a list of ten great automotiveWeb sites for pricing information, ratings, industry news,diagnostic troubleshooting, and more. About Deanna Sclar Deanna Sclar, a leading auto repair expert and consumer spokesperson, has appeared on more than 700 radio and TV programs including Good Morning America, Today, and A.M. Los Angeles. She has contributed to such magazines as Family Circle, New Woman, and Redbook and is the author of the perennial bestseller Auto Repair For Dummies??. PART I: New or Used: Deciding Which Option Is Best. Chapter 1: Making the Right Decision. Chapter 2: Figuring Out How Much Your Current Car Costs. PART II: Auto Recycling without Tears: How to Buy a Good Used Carand Get Rid of Your Own. Chapter 3: Good Places to Find Used Vehicles. Chapter 4: What to Look for When Buying a Used Car. Chapter 5: Shopping for Value and Negotiating the Deal. Chapter 6: Saying Good-Bye to Old Faithful. PART III: Untried and True: Buying a New Car. Chapter 7: Deciding What You Want. Chapter 8: Finding and Testing a New Car. Chapter 9: Getting the Best Deal on a New Vehicle. PART IV: Money, Money, Money, Money. Chapter 10: Should You Borrow, Buy, or Lease?. Chapter 11: Buying a Car with Your Own -- or Someone Else's --Money. Chapter 12: The Perils and Pleasures of Leasing. PART V: Insuring Your Car: How to Cover Your AutomotiveAssets. Chapter 13: My Premium Is How Much? -- Shopping forInsurance. Chapter 14: Step-by-Step through an Insurance Policy. Chapter 15: How to Protect Your Insurance Claim When Things GoWrong. PART VI: Protecting Your Investment. Chapter 16: Warranties and Service Contracts on New and UsedVehicles. Chapter 17: Beating the Bad Guys at Their Own Games. Chapter 18: Finding a Good Repair Facility (And What to Do IfYou're Ripped Off Anyway). Chapter 19: Renting a Car. PART VII: The Part of Tens. Chapter 20: Ten Things Not to Do During Negotiations. Chapter 21: Ten Great Automotive Web Sites.